Several months ago, when I was visiting my grandfather in the hospital in western Oklahoma, I made a delightful discovery. In this particular moment, Grandpa was in and out of sleep, but Grandma was there, too, along with my mom and my brother, and we really just needed some way to pass the time in the hospital room. I had brought my guitar along, intending to sing and play some of the old country and Southern gospel tunes my grandfather loved, especially those songs that were popular back when he was playing guitar in a band during his Army service. I asked Grandma and Grandpa what they wanted to hear, but they told me to play whatever I wanted. I tried a couple of old Protestant hymns – “In the Garden” and “The Old Rugged Cross” – but they were a bit too sad right then. Blinking back tears, I decided we needed some upbeat, silly song. A certain Lefty Frizell classic came to mind. 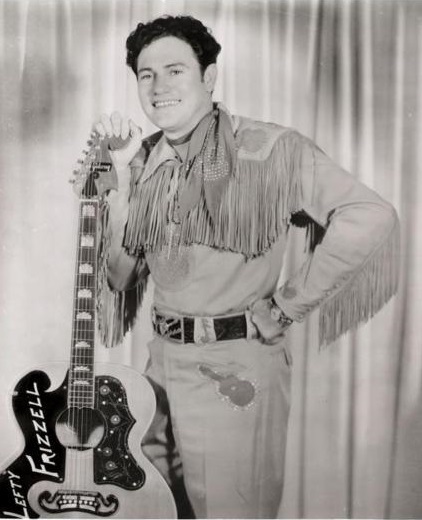 This song launched Lefty Frizzell’s successful career in country music. Later, this song hit number one on the country charts again in 1976, with Willie Nelson’s cover version. I really didn’t expect my grandparents to know this particular song. I honestly thought my grandparents’ interest in popular music stopped in the World War II years (which just goes to show how little even a music therapist might know about their family’s musical inclinations.) But wouldn’t you know that my grandma’s eyes lit up when I started playing this song? I played a couple of verses, with my grandma smiling, and my grandpa perking up a bit. When I finished singing, Grandma told me that she had that single on a record when she was in college, and she recalled listening to it with her roommate while each of them waited for their dates to call or come by. Of course, at some point, her beau was the man who would become my grandfather. My grandma neatly avoided telling us any more about her time dating Grandpa, but I cannot tell you how special this moment has become for me. All of a sudden, I had a new image of my grandma – or the young lady I’ve seen in pictures – chatting with a girlfriend and dreaming about that handsome young man I know from a couple of black-and-white Army photos. We had the briefest glimpse into my grandparents’ lives together before any of us were even imagined. This marvelous musical discovery happened at a time when my grandfather was very weak and tired, just a few weeks before his death, and when my grandma was definitely tired and probably quite worried and in physical pain, although she would never let us see that. Sharing this song was one of those amazing experiences that I had hoped for but didn’t predict. It just goes to show that taking the time to discover those special songs can definitely be worth it. Theme – Country Courtship: This song fits well into country music playlists and can spark discussion about the artists (Lefty Frizzell or Willie Nelson) or about going to honky tonks. Some people may have stories about dating and courtship to share, especially if they grew up in the rural areas where this style was very popular. Drumming: The most helpful aspect of this song’s structure is the last line of each verse, which is split into two parts (“if you’ve got the money honey/I’ve got the time.”) When drumming, split your group in two and have one half play on “if you’ve got the money” and have the other half answer “I’ve got the time.” Encourage groups members to look at each other as they play, like they are having a conversation with the drum. Movement: You can use the same musical structure described above for movement to music, too, cueing participants to point out for “if you’ve got the money” and at themselves for “I’ve got the time.” Use the rest of the verse to cue other rhythmic movements, making more complex patterns for people who are higher-functioning. I’ll have to check that out, Peggy. Thank for the suggestion! What a beautiful memory for your grandma to share! Love these old songs and the ideas you share around them, Rachelle. I cant wait to add this one to the list! Thanks for sharing the sweet experience!